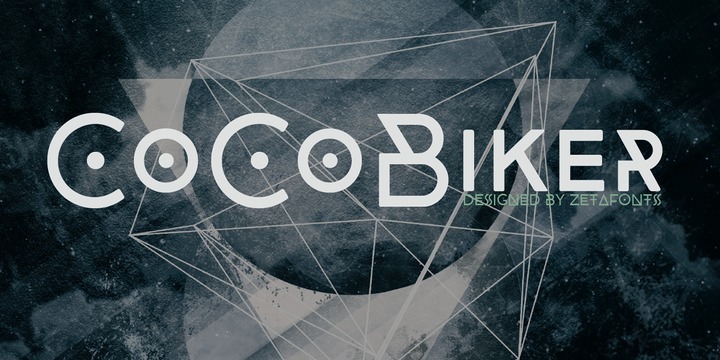 CocoBikeR is Contemporary sans serif typeface created by Cosimo Lorenzo Pancini and published by Zetafonts, a variant of Coco Gothic family. It is available in 5 weights, useful OpenType features and multilingual support. Also has special dingbats and symbols for bike lovers and for those how love hipster culture. CocoBikeR is a Small Caps typeface with a vertically centered lowercase. Enjoy! Price: starting from $29,00 for one font, to $80,00 for all 5 fonts. A font description published on Tuesday, October 3rd, 2017 in Cosimo Lorenzo Pancini, Fonts, Zetafonts by Alexandra that has 2,410 views.